^ ロシア大百科事典 (2005) vol. 3, p. 618. ^ http://www.stel.ru/stalin/Soviet_power_1919.htm - "November 27 The Presidium of the A.R.C.E.C. 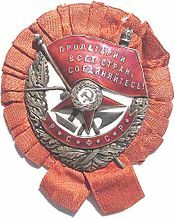 confers on J. V. Stalin the Order of the Red Banner for his services in the defense of Petrograd and selfless efforts on the Southern Front."